Dali Mpofu was born Daluxolo Christopher Mpofu in East London in the Eastern Cape province of South Africa. He is an advocate and business executive. He was the chief executive officer (CEO) of the South African Broadcasting Corporation (SABC), he was a prominent member of the African National Congress (ANC) until 2013 when he joined Julius Malema’s Economic Freedom Fighter (EFF) and he represented the miners who were injured during the August 2012 Marikana Massacre and those who were arrested at The Farlam Commission of Inquiry. He went to Mzomhle High School in Unite 1 of Mdantsane township in the Eastern Cape. 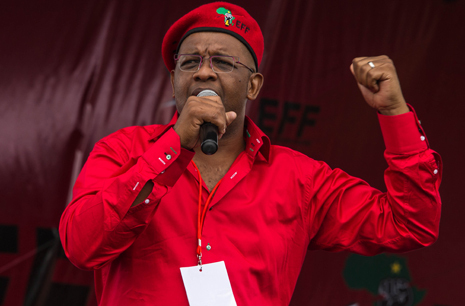 In 1988 Dali Mpofu completed his Baccalaureus Procurationis (BProc) (LLB) from the University of the Witwatersrand, Johannesburg in Gauteng province. In 1992 he completed his LLB also from the University of the Witwatersrand in Johannesburg. Dali Mpofu reportedly joined the African National Congress (ANC) in 1980 at the height of the political struggle of South Africa which set out to oppose and do away with the apartheid system. He served as Winni Madikizela-Mandela’s deputy on the Social Development Department of the African National Congress(ANC) before the 1994 General Election of South Africa. In May 1992 Dali Mpofu was dismissed from that position following the allegations of misappropriation of funds. Winnie Madikizela-Mandela, who was also implicated in the allegations, voluntarily resigned. Dali Mpofu threatened to sue (presumably, the African National Congress which dismissed him) for wrongful dismissal but never pursued the claim and was later quoted saying “I don’t want to comment on these things, these are old claims”. It is understood that after African National Congress’ victory at the 1994 General Election Dali Mpofu did not hold any government position nor did he go to parliament under Nelson Mandela‘s administration or the subsequent administrations. Down the years He has remained in the business sector and held numerous positions, among others: Non-Executive Director of Thebe Securities (PTY) Ltd – now Thebe Stockbroking (Pty) Ltd; Director of ABB Powertech; Director of Battery Technologies (Pty) Ltd; Director of Rentech; Director of Powertech; Group Executive Director of Altron Group; Chairman of Utajiri Investments; and Director of Altech. It is understood that ABB Powertech, Battery Technologies (Pty) Ltd, Powertech and Altech are sister companies and are subsidiaries of Allied Electronics Corporation Limited (Altron Group). Dali Mpofu have the Advocate of the National Anti-Corruption Task Team since 1999 and Chairman of the National Anti-Corruption Forum since 2001. In 2002 Dali Mpofu became president of Electronic Industries Federation, a position he held until 2006. In 2004 he became chairman of Victim Support South Africa/ Business Against Crime and held that position until 2005. In 2005 Dali Mpofu held his most high profile post to date, he became Group Chief Executive Officer (CEO) of the South African Broadcasting Corporation (SABC) until 2009 when he was dismissed. His time at the SABC was marred by controversy and allegations of financial mismanagement, political interference and sidelining of his (and those of the group) critics. During the time when he was CEO of the SABC, Dali Mpofu was also the Chairman of the board of Boxing South Africa – a post he also left in 2008 to focus on the SABC. Also in 2005 he became Council Member of the International Marketing Council of South Africa, a position he has held since. In 2006 Dali Mpofu became the Chairman of the board of Proudly South African and President of Southern African Broadcasters Association; he still hold both those positions to this day. He is also an Acting Judge for the Labour Court of South Africa and Chairman of the ICT BEE Charter Working Group. Dali Mpofu represented Julius Malema in the 2011 – 2012 ANC disciplinary hearing that resulted in his [Julius Malema] expulsion from the African National Congress.